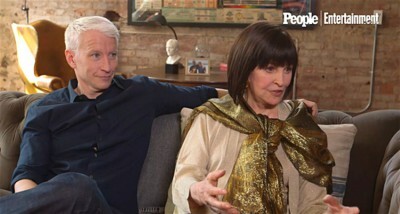 After working with his mother on a book and documentary about her life, Anderson Cooper thought he knew everything there was to know about Gloria Vanderbilt. It turns out the famous heiress and fashion icon had still more to tell. Cooper was visibly shocked when mother and son sat down for a recent interview and Vanderbilt, 92, revealed that she once had a brief lesbian relationship as a teenager and a student at Miss Porter’s School in Farmington, Connecticut. ‘What? Hello. This is news to me. You didn’t mention this in the book, Mom,’ the CNN anchor said during the pair’s interview with People Magazine. ‘I went through a brief so-called lesbian relationship with a girl in school,’ Vanderbilt said. Vanderbilt’s mother, Gloria Morgan Vanderbilt, had lost custody of her during a famous custody trial in 1932 and during the trial was ‘accused’ of being a lesbian. The book Vanderbilt and Cooper wrote together is The Rainbow Comes and Goes and the new documentary he did on his mother is called Nothing Left Unsaid. That would be a surprising thing to find out about a parent, especially when they are in their nineties!